Guest posts from other successful Blogger users. Re-shares of interesting posts from your blogs. Personal posts from members of the Blogger Team, so you can get to know us better. In the coming weeks, I’ll be asking you to submit quality blogs that you enjoy reading. Each week, I’ll post a sample of the best blogs I’ve found within a certain theme (food, design, sports, etc) or, that incorporate a recently-released feature. I encourage you all to nominate blogs that don’t necessarily have an established following, since we’d like to promote new bloggers who could benefit from more interactions with other bloggers and more readers. Also, we’ll be sure to credit the nominators, so you’ll be getting a readership boost, too! Please say hello via comments, and tell the Blogger community a little about yourself. Also, look out for the first request for blog nominations coming soon. For more than a decade now, the Blogger team has watched our community of users grow dramatically and have had the pleasure of seeing some truly amazing blogs along the way. Here on Buzz, in addition to keeping you updated on new features, we’re going to focus on engaging with our user community and connecting more readers to exceptional blogs. A revolving showcase of funny, interesting, beautifully designed, creative, and just plain awesome blogs. One of the things I often hear is how challenging it can be to generate ideas for topics to write about. This may be especially true for popular blogs when you feel as though your followers are eagerly awaiting your next post. Sitting down and staring at your computer with the hope of feeling inspired can result in disappointment. On my blog for example, I have a mix of posts that were authored be me, and articles that I've discovered elsewhere that I think may be of interest to others. Like many of you, there are times when I have things that I’m eager to write about, and other times when I just want to share something. If this sounds familiar, you may find the “Blog This!” Chrome Extension of interest. It enables you post to your blog from any web page with just one click. The Extension is available on the Chrome Web Store under the “Blogging” category. When you install the extension, a button will appear on your browser toolbar. Simply click the button to open Blogger in a new application window. The new post is pre-populated with a link to the web page you're on, as well as any text you've highlighted on that page. Edit the post to your liking and post it instantly to your blog.
. Today, we’re excited to announce that not only will these templates be available to everyone, we’ll be supporting all 27 Template Designer templates. We invite you to make your blog smartphone-friendly by going to the Dashboard > Settings > Email & Mobile tab and enabling the mobile template option. 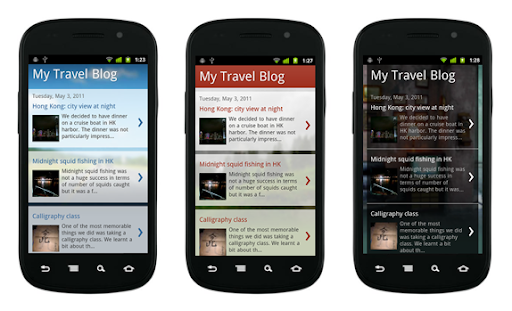 Blogger mobile templates are mobile-optimized versions of our Template Designer templates. If you are using one of these templates, when you enable the mobile template option your blog will begin rendering using the mobile version of the same variant. Even if you are not using a Template Designer template, or using a heavily-customized version of one, you can still enable this feature to have your blog start rendering in a generic default mobile template that we have created. Preview: Get a glimpse of how your blog will be displayed by clicking on the Mobile Preview button. You can also see it on your smartphone by scanning the QR-code. Automatic redirection: Viewers will see the mobile version of your blog when accessing from smartphones*. Template support: We are now supporting all 27 templates. Some gadgets are also supported**. Mobile ads: Mobile AdSense ads will be displayed at the top of the post pages and at the bottom of the index page if the blog has an AdSense gadget or in-line blog ads. Comments and videos: Viewers on smartphone devices will be able to make comments and watch videos. We hope you enjoy the mobile templates. As always, we would love to hear from you so please let us know what you think through our feedback form, and stay tuned for future improvements. *WebKit-based mobile browsers are supported for this launch. **Supported gadgets/elements in this launch: Header, Blog, Profile, AdSense, Attribution. A few months ago we introduced mobile templates to Blogger in Draft. Today, we’re excited to announce that not only will these templates be available to everyone, we’ll be supporting all 27 Template Designer templates. We invite you to make your blog smartphone-friendly by going to the Dashboard > Settings > Email & Mobile tab and enabling the mobile template option. Since Google made this feature available, web publishers and bloggers have been asking us how they can add the +1 button to their sites, including Blogger blogs. Today, we’re excited to let you know that you can add the +1 button to Blogger blogs with just a few clicks. To add the +1 button to your blog, you’ll need to enable Share buttons on Blogger. To do this, go to Design > Page Elements on your Blogger dashboard, find the Blog posts area, click on Edit, and select the “Show Share Buttons” option. If you are already using Share buttons, the +1 button will automatically show up as a new share option. By adding the +1 button to your blog, you’re providing an easy way for your visitors to recommend your posts to their friends right from your blog. Here’s how it works: Let’s say you blog about biking. One of your readers, Tom, finds your recent post about mountain biking interesting, and clicks on the +1 button. Now, when Tom’s friends and contacts search for biking or mountain bikes and your post appears in Google search results, they might see an annotation showing that Tom +1’d your post, helping your content stand out. We hope +1’s will help your blog stand out better in search results, which could increase both the quality and quantity of traffic to your blog. Now, that’s indeed a big +1, isn’t it?